First Line: "Being the good daughter wasn't easy." Review: Just for the record I never read the first book in the series but I did not feel lost once while I was reading Played it can easily be a standalone. Sam and Riley have pretty much stereotyped each other and based off that alone don't like each other but all that changes one day when they end up being partnered up during a leadership conference and an accident happens that causes the two to spend the night out in the woods alone where they somehow have a bonding moment in which they tell each other a secret no one else knows. Riley kind of rubbed me the wrong way from the very beginning she is supposed to be this amazingly smart girl but wow does she do some extremely stupid things that makes it incredibly hard to believe that she is smart at all. What annoyed me the most was the promise she made to Sam, that she would get him and Fred (brothers girlfriend) together knowing how much her brother loved Fred. And then she puts herself in other incredibly dangerous situations that just had me a little shocked because while she is doing all these stupid things we are still being told how smart she is. I did like Sam. I didn't read the first book but I got the gist of it that he was in love with Fred and still is. So he is all heartbroken and in a way a bubbly person like Riley is someone he needed to get him out of that funk. Also I loved the diversity in the book Sam is a Native American and we do get to learn bits and pieces about his culture although I wish the author would have dived a little deeper into it. 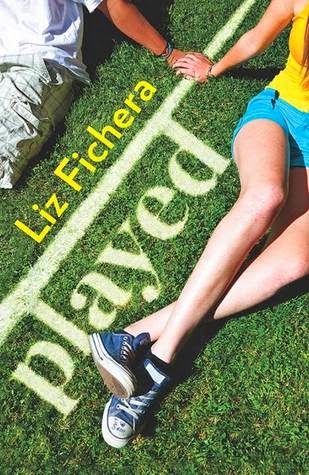 Overall I found Played to be a very quick read even though I did have mixed feelings about one of the main characters I still couldn't put it down because I had to find out how things were going to work out and it was fun to see the relationship between Sam and Riley grow into what it did in the end.